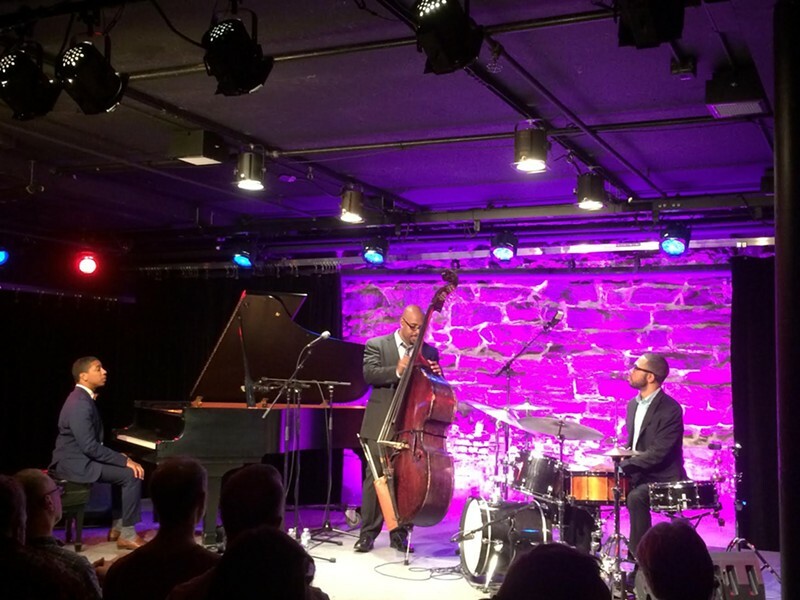 The internationally touring Christian McBride Trio — made up of McBride, pianist Christian Sands and drummer Jerome Jennings — began their five-song set at the FlynnSpace with “Ham Hocks and Cabbage,” an original instrumental piece from their album Out Here. The tune started out simply, then sauntered into a jazz groove that became layered and more complex. Afterward, McBride described it as “a certain kind of song. It is a jazz song, a swing song, but it is another kind of song that starts with a letter B.” He asked the audience to guess what that B stood for. McBride called on a young boy with a raised hand. “What were you going to say, my man?” he asked. The boy guessed that the word was “upbeat.” McBride good-naturedly responded that even though there was a B in it, that wasn’t the word. The answer he was looking for was “blues.” But McBride handed the boy a Milky Way for trying. The following query was about the group's next song, a tune made popular in the 1930s by a man with the last name of Ellington. “Raise your hand if you know his first name,” McBride challenged the group. Lots of hands shot up, and the chosen kid answered correctly and received a treat. That song was Duke Ellington’s “Caravan,” and the trio played it fast while adding their own distinctive flavor to its procession of shifting melodies and beats. The trio went on to prove that statement with jazzed-up renditions of “Send One Your Love” By Stevie Wonder (who, McBride noted, was twelve-years-old when he started recording), followed by “I Have Dreamed” from The King and I. The hour long concert concluded with a little surprise that fully hammered home the point: “A song that we’re not sure you’ve ever heard done as a jazz song before,” McBride said, adding that it would be familiar to everyone.